What do you get when you cross a mogul, a mom and a makeup visionary in Maryland? 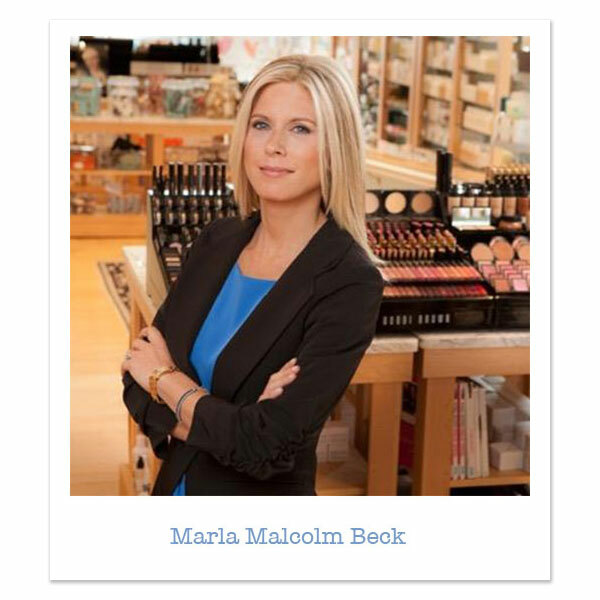 Marla Malcolm Beck, the CEO and co-founder of Bluemercury, Inc. As the creative force behind one of the most innovative and fastest-growing luxury beauty retailers in the country, Marla has logged countless hours testing products, challenging brands, learning from consumers and inventing better solutions (see her own lines: M-61 Skincare, the first highly technical, natural cosmeceutical brand and Lune+Aster, a new, natural, foolproof makeup line). 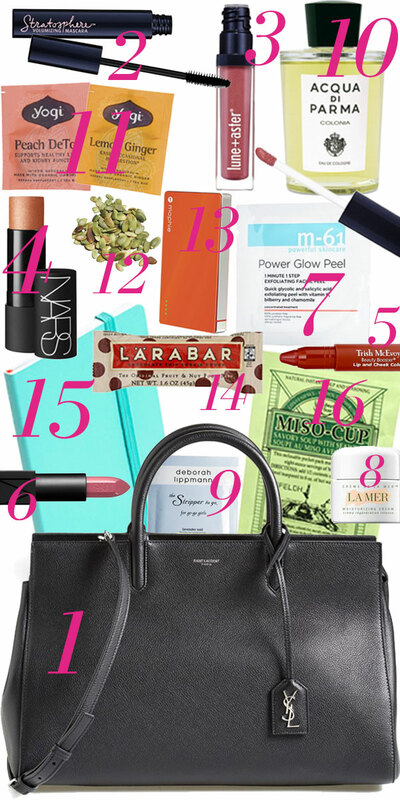 With an impressive collection of rose lipsticks and Harvard degrees, this impeccably groomed powerhouse keeps it all together with a few secrets stashed in her designer bag of tricks, including a black J. Crew cardigan ("I am always cold, and I own five of the same one.") and statement jewels ("I always keep a dangly pair of clip earrings in my bag for instant day-to-night glamour."). Whether Marla's in a lab, on the road or at a soccer game, she totes a few time-tested necessities in a black leather Saint Laurent Cabas Rive Gauche tote (1). If you're lucky enough to rub elbows with Marla, you can count on it being frictionless. She treats her limbs with La Mer. How's that for elbow grease? (2) Lune+Aster Stratosphere Volumizing Mascara: "Layerable so you can touch up your lashes throughout the day with no clumping." 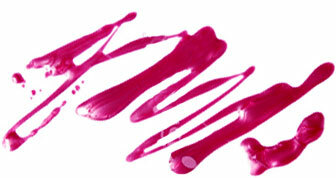 (3) Lune+Aster Lip Gloss in CEO: "Yes, I designed this vegan Vitamin C and E gloss for myself!" (4) NARS The Multiple in South Beach: "A cream blush that adds instant pop to your cheeks and Trish McEvoy eye brightener pencil, an undereye miracle brightener." (5) Trish McEvoy Beauty Booster Lip and Cheek Color in Perfect Plum: "My nighttime look, popped up with Lune+Aster Lip Gloss in CEO (2)." (6) NARS Audacious Lipstick in Anna: "I always keep a bunch of lipsticks and lipglosses in a see-through plastic case for a quick change from day into evening. My daytime look right now is a neutral lipstick or lip pencil – NARS Audacious Lipstick in Anna or Bobbi Brown Lip Color in Brown with Laura Mercier Plumberry lip pencil." (7) M-61 Power Glow Peel: "The miracle peel that gives you instant glow in one minute, packaged in convenient individual use packets." (8) Crème de la Mer deluxe sample: "This multitasker is unbelievable not just for dry patches on face, but for dry knuckles, and elbows, too." (10) Acqua di Parma Colonia: "I love keeping a fragrance in my bag. I am completely addicted to Acqua di Parma Colonia." (11) Yogi Tea in Peach Detox and Lemon Ginger: "I just ask for hot water on airplanes and have an instant moment of peace." (15) Poppin notebook in aqua blue: "For ideas that just need to be written down by hand and not electronically." (16) Miso soup packets: "I hate it when I arrive to a hotel late and am starving. Rather than order a big meal late from room service, I just ask for a pitcher of hot water and a mug – instant healthy meal!"